I’m pretty sure our radio differs in the amount of news it conveys. Even the mostly music channels have news updates every half hour. I’m sure there is one thing people never hear in other countries: instructions on what to do if you find yourself outside, driving during a missile bombardment. Yes, Israel does have the Iron Dome missile defense system. It works very well (aprox 90% success rate) however some missiles do get through. The Iron Dome works by sending another missile to hit and blow up the one aimed at Israeli civilians. This means that even when the system works, the pieces of the exploded missile are in the sky and they have to land someplace. Boiling hot chunks of metal cause damage when they land – they can damage buildings, maim and even kill. Then the voice moves on, to announce the next song or the next topic to be discussed. 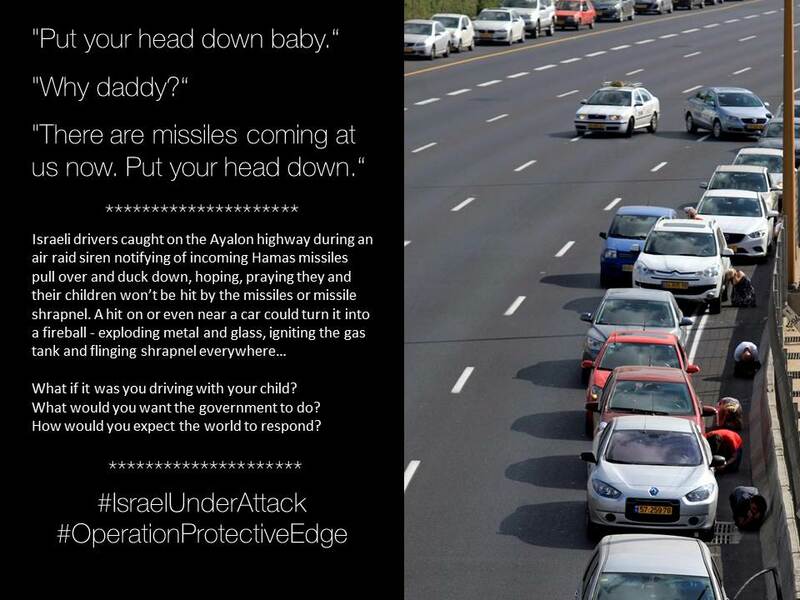 These calm instructions have helped protect countless Israelis. Instructions on how to take cover and what to do when there is no cover have saved lives and prevented injuries. Having these repeated over and over again on the radio is a public service of supreme importance. It is very good to have these safety instructions on the radio. The fact that they are repeated calmly numerous times helps people remember what to do when they are scared and stressed because their lives are in danger. The fact that we need these at all is completely insane. The fact that people think it is ok for Israelis to live like this is insane. The threat of these missiles is not “laughable” as many (left-wing) media commentators have claimed. The fact that Israelis protect themselves does not mean there is no threat to us. The fact that many Israelis have managed to escape with their lives intact (although their homes were ruined or they were wounded) does not mean that we are living in safety and that it is ok to continue this way. Why is this so hard for people around the world to understand?